When it comes to accessorizing I must admit I favor the statement necklace or a large cocktail ring over earrings. I all too often forget to remove the diamond studs that were gifted to me from my dad and have been wearing since I was sixteen. I also find when I do go for earrings it's usually only in the warmer months where a large chunky necklace feels oh so suffocating. I think summer attire is also all a bit more revealing around the decolletage area allowing a larger earring to be noticed. However I may break all by styling habits after my sister gave me a gorgeous pair of colored drop earrings this Christmas...however one rule I can never break is a statement earring/necklace combination - it's all too, too much for my taste, I prefer to pick one bold statement piece and minimize the rest so you don't look like your wearing your entire jewelry box. What do you think of these styles, would you wear this look??? I used to wear earrings ALL the time but now I feel like they just get all caught up in my hair. Why is life so hard? 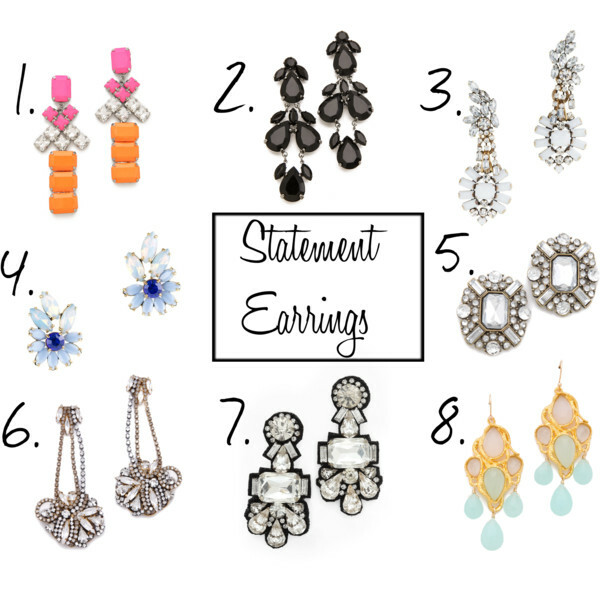 I never take out my diamond studs either...but I do love the statement earring look. I'm a fan of the Alexis Bittar Chalcedony earrings you featured ~ they remind me of mini chandeliers :-) Now if I only had the patience to coordinate earrings into my wardrobe...argh, too much to think about!